Today’s card is being featured on Stylin’ Stampin’ Inkspiration. 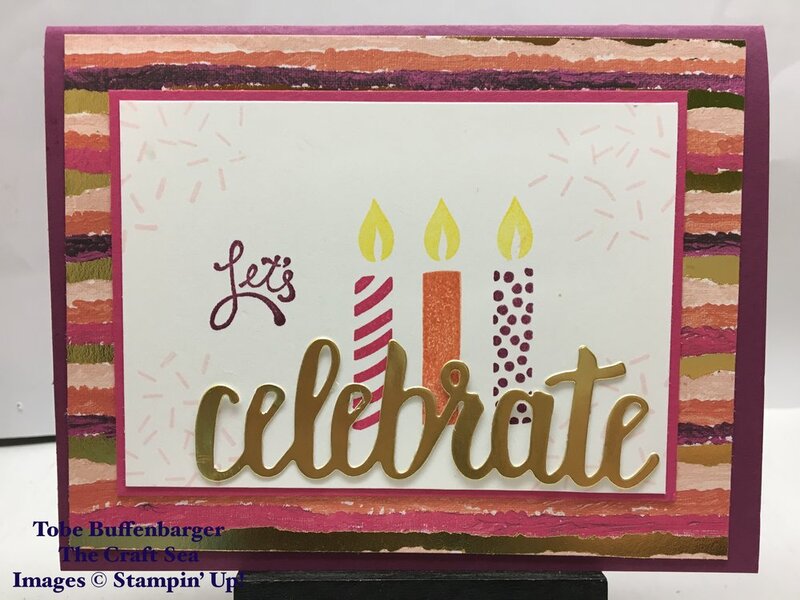 The challenge was to create a card using our favorite Sale-a-Bration item. For my card, I used two! As soon as I saw the SAB brochure, I knew that I needed to own the Amazing You Stamp Set and Celebrate You Thinlits immediately. They are cute on their own, but together they create such a lovely card. I started with my small piece of Whisper White and stamped some fun candles and sprinkles. I die the "celebrate" and then stamped the "let's" to to my placement correct. I layered the piece onto some Melon Mambo cardstock before layering onto some truly gorgeous paper from the Painted with Love Specialty Designer Series Paper pack. It's a little hard to tell in the photo, but the paper features strips of gold foil. This card is super shiny!